--3 Rapid Response questions where your answer must be two to three sentences in length. --Primary Source questions based on The Providential Detection political cartoon. Make sure you can identify the following based on a description. There will be a word/phrase bank for 15 of them and 5 you must know from memory. You will be asked to list ONE value and ONE limitation of the cartoon based on its Content. You will be asked to list ONE value based on its origin. How is Thomas Jefferson’s position toward France in the late 1790s reflected in this cartoon? 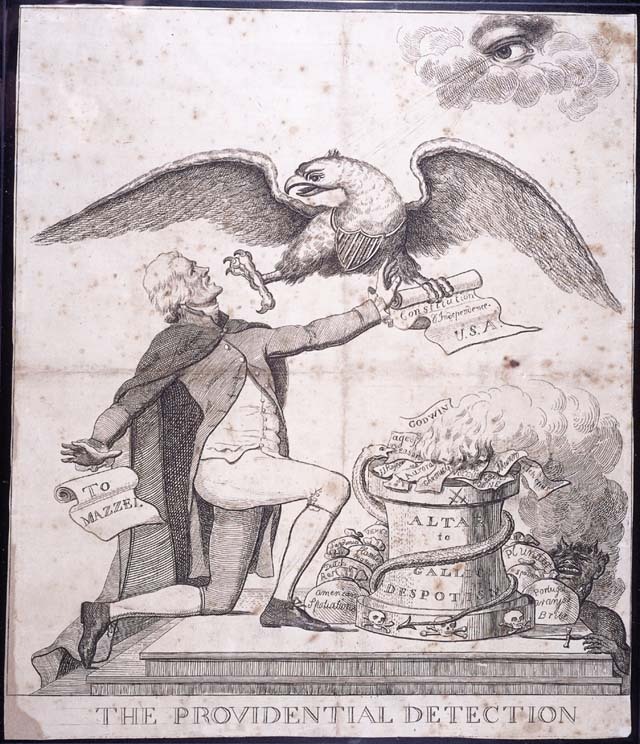 How might this cartoon have been used to influence public opinion in the presidential campaign of 1800? What does the eagle symbolize? What does it prevent Jefferson from doing? What elements of the cartoon show Jefferson’s attitudes toward France? What opinion about the French government of 1797 does the cartoon express? What is the main idea expressed in the cartoon? -How did the Louisiana Purchase affect the United States and its government? Review your answer (#5) on your 6-3 Worksheet that was submitted on Jan. 25. Jefferson authorized purchase of the territory for $15 million even though he doubted whether the Constitution allowed the government to acquire new territory. The Senate approved the purchase. 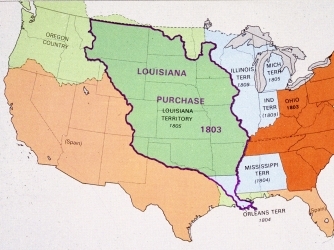 The Louisiana Purchase territory more than doubled the size of the United States in 1803. -Why did the War Hawks - led by John C. Calhoun and Henry Clay - call for war against Britain? U.S. must defend its neutrality between France and Great Britain. -Why were southern and western states more willing to go to war than mid-Atlantic, Northern and New England States? -How did the Battle of Tippecanoe hurt the cause of the Native Americans? -Why was the Battle of New Orleans such an important accomplishment for America even though it was fought following the armistice? What were the five major causes of the War of 1812? Be able to describe each in at least one sentence. What was the major effect of the War of 1812, with regards to the Treaty of 1818? What was the significance of this treaty and what did it accomplish? Be able to support in two to three sentences. The British blockaded France in order to prevent them from trading, but many American ships and their cargo were taken because of it, which angered American traders. The British would board ships looking for British deserters, but also took Americans too, which ended up causing some naval fights and challenging the sovereignty of the U.S., which angered Americans. In response to the British blockade of France, Jefferson started a U.S. embargo, so that the French and British would have to beg us to trade with them again, but it backfired and hurt the U.S. more than anyone else. In response to settlers invading Native American lands, Tecumseh and his brother, The Prophet, started an alliance of Native American tribes who allied with the British and attacked American settlements. A group of senators, including Henry Clay and John C. Calhoun, wanted war against the British in Canada and to destroy Tecumseh’s Confederacy. This treaty set the upper boundary for the Louisiana Purchase at the 49th parallel, thereby setting a clear border between the U.S. and Canada. It also set up joint occupation of Oregon Territory between the U.S. and Britain. This started an about 200 year period of peace between the two nations. The War Hawks - "On to Canada!"